As a postdoctoral researcher in the Department of Geological Sciences at the University of North Carolina at Chapel Hill (USA), most of my work is centered around geomorphology (predicting changes on Earth’s surface). Recently I have also focused on how Earth Scientists communicate with each other and the public on social media and across the Web. Much of my preliminary work appears on my blog and formed the basis for my Altmetric research grant proposal — investigating how scholarly citations in Wikipedia appear. My proposal is motivated by my own personal experience. I have edited Wikipedia to include references to my own articles (in addition to references to other articles that I did not write), and I have wondered how citations to scholarly literature in Wikipedia are generated (i.e., are most mentions generated by journal article authors?). To address this question I will be focusing my effort on the >33,000 article corpus from the high impact, high volume (>1000 articles/year) Earth science journal ‘Geophysical Research Letters’ (GRL), a society journal of the American Geophysical Union. GRL is well represented on Social media and across Web (for an Earth Science journal), for example, most articles are mentioned on Twitter, and many are mentioned multiple times. Earlier this year I looked at the Wikipedia mentions for GRL articles published through 2015 using the DOI records for GRL articles (through 2015; downloaded form the Web of Science) and Wikipedia mentions from Altmetric retrieved using the rAltmetric package created by rOpenSci. In total there were more than 1000 GRL mentions on Wikipedia. 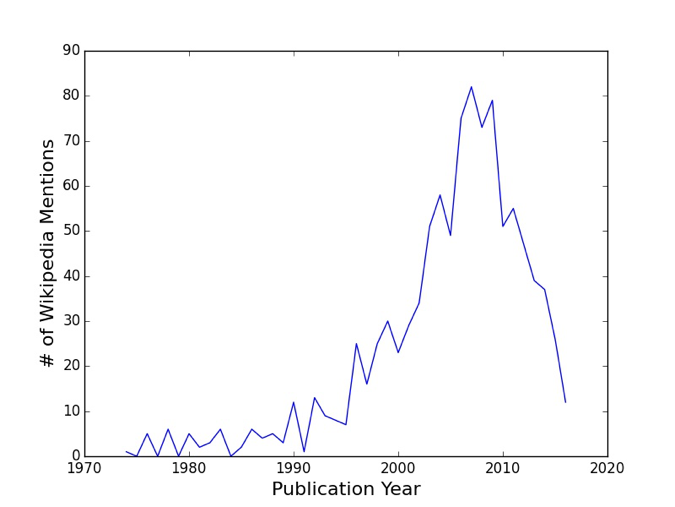 The figure below is a plot of the number of Wikipedia mentions for GRL articles published in a given year. For my Altmetric research grant, I intend to use an expanded version of the data in this plot to answer three linked questions. First, I will investigate what percent of Wikipedia citations of GRL articles can be traced to the GRL article authors. Second, I will determine when mentions in Wikipedia occur relative to article publication. Third, I intend to examine specific Wikipedia edits to determine the number of words added and if editors tend to add a single or multiple citations. My enthusiasm for this research topic is also rooted in my belief that Wikipedia represents a mechanism for scientists to engage with a wide audience. Since Wikipedia is one of the largest websites in terms of global web traffic, it represents an opportunity for researchers to provide long lasting outreach and engagement with both academic and non-academic audiences. As an example, page views for geomorphology articles on Wikipedia are much larger than page views to my own scientific articles. Yet for many of the critical Earth and Space science journals, papers are only rarely mentioned on Wikipedia, even with the growing call for academics to edit and engage with Wikipedia (e.g. Logan et al., 2007; Bateman and Logan, 2010; Bond, 2011; Mandler, 2016; Goldstein, 2017). 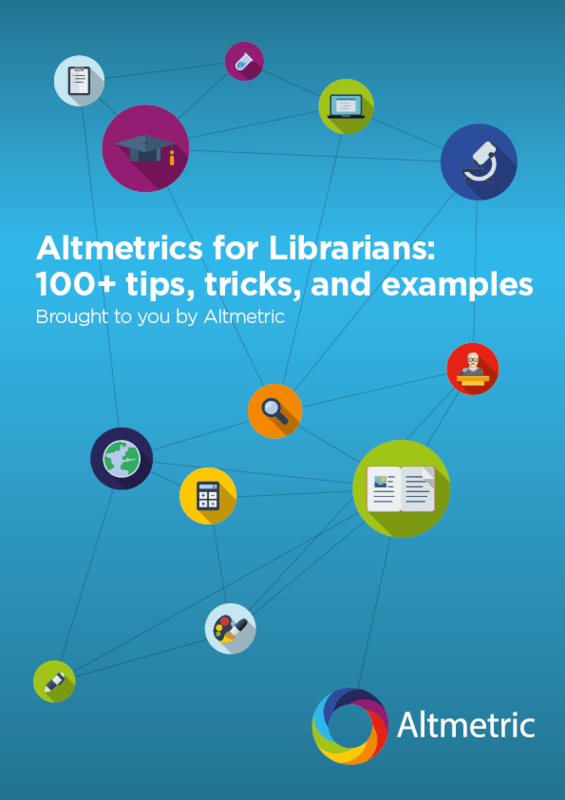 I look forward to pursing this research and sharing the results over the coming months and would like to thank Altmetric for the support.